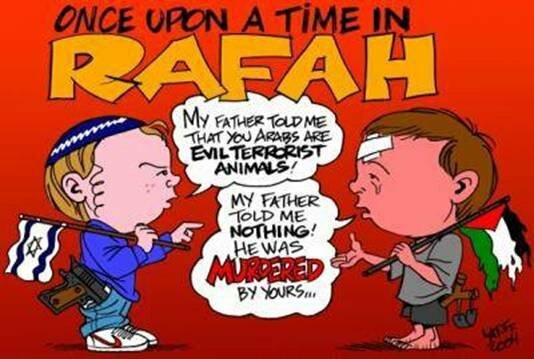 So true and sad, my opinion: most of the people when they are talking about Jewish they think as the poor people who had a sad past full of oppression (true but…) but they don’t think about now, how bad Jewish are acting with the Palestinian. I remember one day, I was in a english class and somebody did a speech about Jewish and how bad and sad was their history due to the Germans. But suddnly, a friend of mine from Libia said; “but what about now, Jewish are acting so bad and killing all this Muslim children in Palestine”. He was really upset and I really understand him. People should also start think to the other face of Jewish. Why does it have to be an either/or? A people can have a history that is both tragic and misguided–the tragedies in the Middle East today does not mean that Jewish history before 1948 is not also tragic (and not just because of Germany, but also a lot before that too). Also, there are about 15 million Jewish people around the entire world, and they all have different backgrounds (some of European heritage, some of Arab descent), act differently, have different politics, different nationalities. Most Jews are not even Israelis. And even within Israel itself the Jewish citizens there have different perspectives on the occupation–there is a very strong Leftist, anti-occupation portion of the population, especially among intellectuals. So let’s not make this trying to say that Israel’s bad behavior now makes up for Europe’s bad behavior in the preceding few centuries, and also let us not say that Europe’s past bad behavior allows Israel’s bad behavior today. This reminds me of spending a summer working on a research project to implement multi-cultural insight and tolerance in Grade 7 (age 12ish) English (communications studies) classes. Although we completed the educational unit, we concluded that 12 was far too old, and students much earlier already held their parents beliefs. What is said and taught to them perpetuates hostilities. Un dialogue de sourds (a dialogue of the deaf) also comes to mind on seeing this. May I use the picture? It says too many things…. With blood on both of their hand when does it end? Let the people be accountable for their own sins and not their father’s sins.